This post is going to be all over the place. But that's not always a bad thing, right? I've been busy sewing over the last couple of weeks. Not really finishing anything but making good progress. First up, my Arkansas Traveler quilt. After lots of cutting, sewing diamonds, paper piecing those diamonds, trimming, trimming and trimming, I have 96+ blocks! It really feels like a huge milestone. 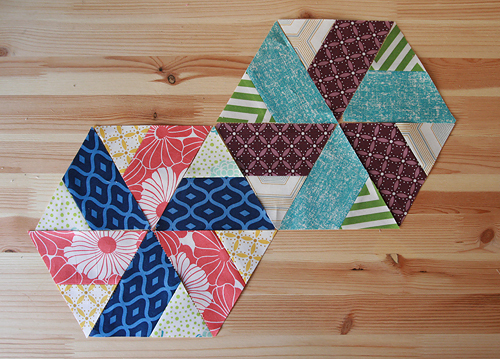 You can find a tutorial to make this block on Lee of Freshly Pieced's site. 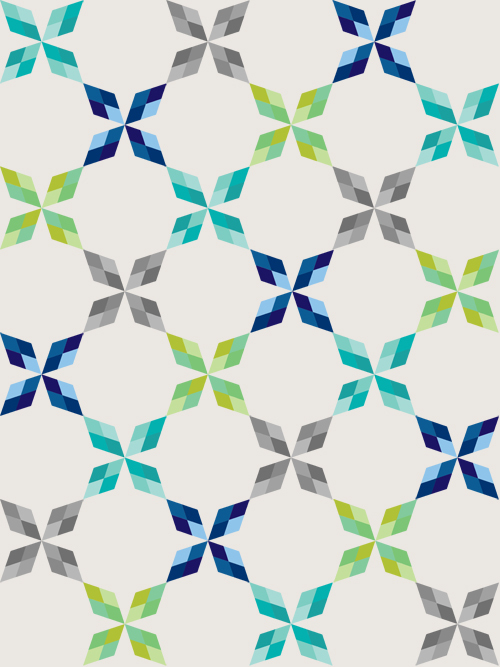 Those of you with an eagle eye might notice my template is a little different than the one from the Summer Sampler Series. I'm trying out something new Lee came up with, less seams, but maybe a little trickier to assemble the final block, depending on how you feel about sewing together shapes other than squares. I know I said I wasn't going to share my final design until I was done. I guess I lied. Here's the plan! This weekend/next week I'm hoping to finish the quilt top assembly. As a bit of a personal reward for finishing all those components, I cut into the little pack of Liberty of London Lifestyle fabric I picked up at Quilt Con. 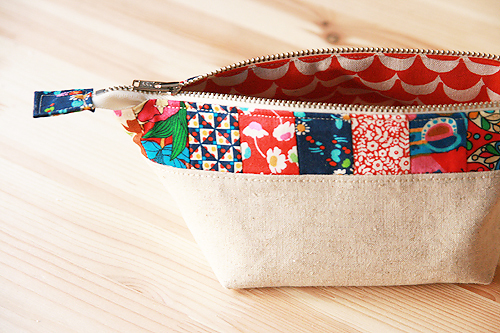 The inside is Stamped by Ellen Luckett Baker for Kokka. This week I also performed a little surgery on my local Modern Quilt Guild challenge quilt top. You can read up on the sadness of unmatching white fabric here. I finished the top yesterday (happy dance!) 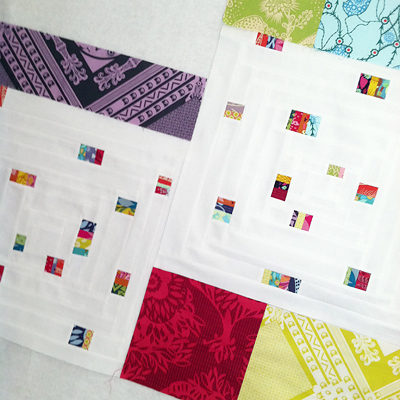 and will share the finished quilt next week. That is a promise - it's due Thursday! I also have been lucky enough to receive some new fabric in the mail this week. 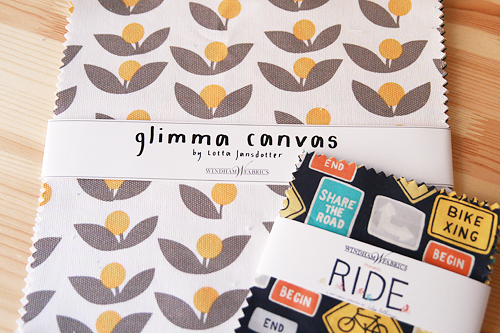 Windham was kind enough to send some of Lotta Jansdotter's Glimma Canvas for me to check out. I don't think I've ever worked with canvas so I'm pretty excited to try something out. They also sent a charm pack of Ride, Julia Rothman's second collection. I seriously love the little bicycle wheels. My son has already claimed this for his own, so I'm thinking of using it in some way to make him a tote bag for the library. 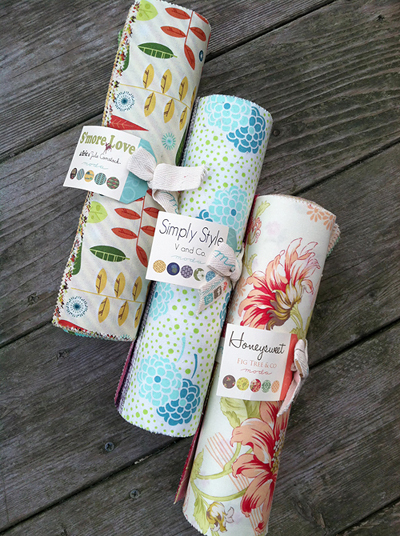 I also had a very happy surprise from Moda Fabrics - three layer cakes of upcoming collections. 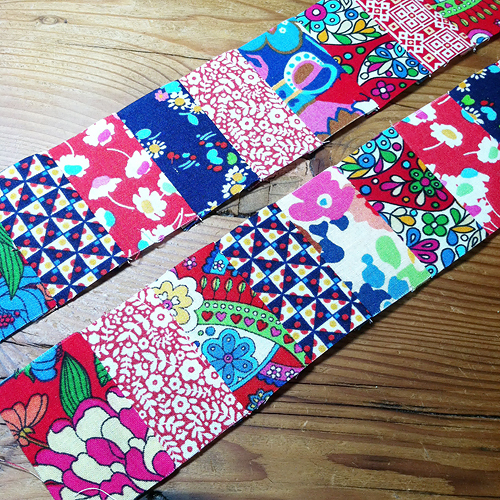 I decided to immediately cut into Vanessa's fabric because, well, I think she's pretty fun. 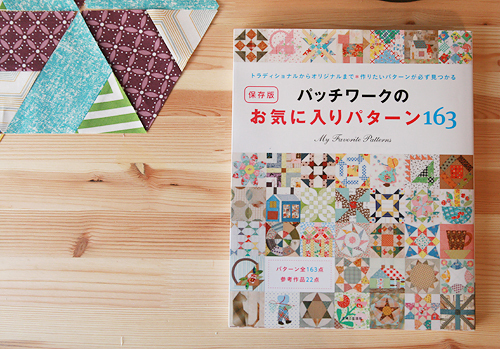 :) I found a block in 163 Favorite Patchwork Patterns : Japanese Craft Book, an awesome book I purchased a few months ago from The Workroom in Canada. And then something funny happened. 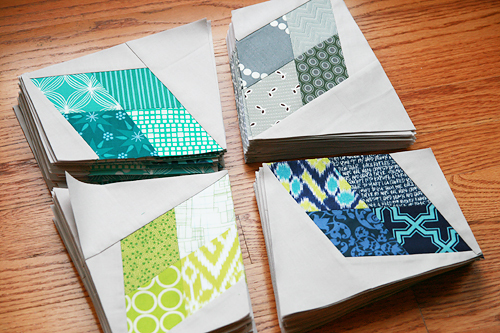 I made these up at pretty much the exact same time Lee was writing up her post to announce her planned Bloom Bloom Pow Quilt Along with a very similar block! Yesterday morning we had a good laugh about how we must be totally on the save wave length after writing the book together. So! 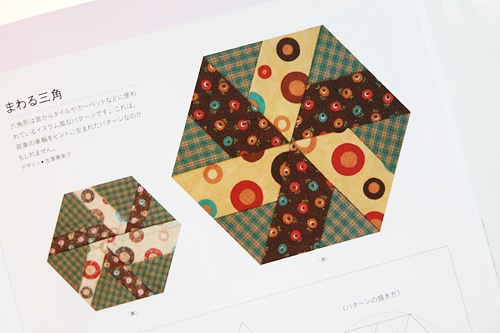 If you like the block, are interested in making the block, you are in luck because Lee's about to start her quilt along and will have tutorials for you. Her block just has some great additional shading. Phew! I hope some of you made it through all that! Next week is Spring Break here. (As I ignore the -4 degree wind chill and snow outside...) I'm not really sure if that means I'll get more sewing done (not driving the kids all over the place) or less (more play time with the kids!). We'll see. My newly 4 year old wants to put on a kid art show in the house, so we have big crafting plans. Very exciting! Have a great weekend everyone!